When Lemuel Gulliver sets off from London on a sea voyage, little does he know the many incredible misadventures awaiting. Shipwrecked at sea, nearly drowned, he washes ashore upon an exotic island called Liliput--where the people are only 6 tall. Next he visits a land of incredible giants called the Brobdingnagian An alternate cover edition of this ISBN can be found here . 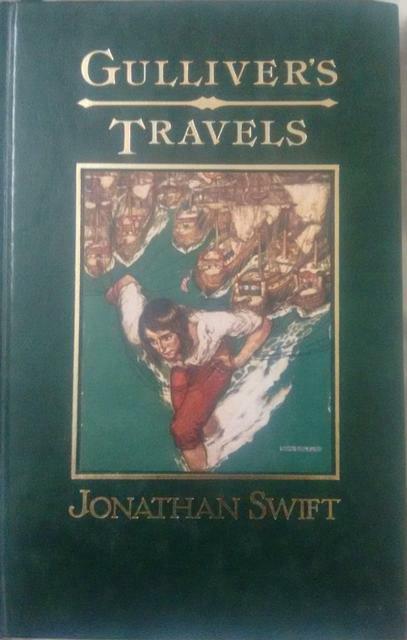 When Lemuel Gulliver sets off from London on a sea voyage, little does he know the many incredible misadventures awaiting. Shipwrecked at sea, nearly drowned, he washes ashore upon an exotic island called Liliput--where the people are only 6 tall. Next he visits a land of incredible giants called the Brobdingnagians. They are more than 60 tall. He travels to Lapauta, a city that floats in the city, & to Glubbdubdrib, the Island of Sorcerers. his final voyage brings him into contact with the Yahoos--a brutish race of subhumans--& an intelligently virtuous race of horse, the Houyhnhnms.